The Cast of Misty Mountains Production. Bilbo Baggins is the title character and protagonist of J. R. R. Tolkien's 1937 novel The Hobbit, as well as a supporting character in The Lord of the Rings. In Tolkien's narrative conceit, in which all the writings of Middle-earth are translations from the fictitious volume of The Red Book of Westmarch, Bilbo is the author ofThe Hobbit and translator of various "works from the elvish"
His role will be played by Gobla, a minstrel with great power and understanding of the role! Gandalf is a character in J. R. R. Tolkien's novels The Hobbit and The Lord of the Rings. He appears as a wizard, member and later the head (afterSaruman's betrayal and fall) of the order known as the Istari, as well as leader of the Fellowship of the Ring and the army of the West. In The Lord of the Rings, he is initially known as Gandalf the Grey, but returns from death as Gandalf the White. His role will be played by Brenter the White of Windfola, and leader of The Crusaders kinship. A high figure in the world of Middle-Earth! Thorin II Oakenshield, son of Thráin, son of Thrór, King Under the Mountain is a major character in the novel The Hobbit (1937), written by English authorJ. R. R. Tolkien. 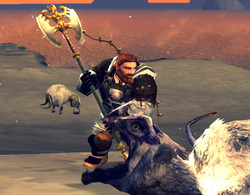 Thorin is the leader of the Company of Dwarves who aim to reclaim the Lonely Mountain from Smaug the dragon. He is the son of Thráin II, grandson of Thrór, and becomes King of Durin's Folk during their exile from Erebor. His role will be played by Snehurka the mighty Crusader! 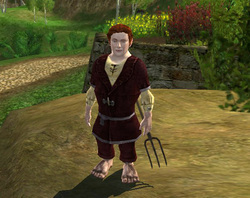 Frodo Baggins is a fictional character in J. R. R. Tolkien's legendarium. He serves as the primary protagonist of The Lord of the Rings. Frodo is a hobbit of theShire who inherits the One Ring from Bilbo Baggins and undertakes the quest to destroy it in the fires of Mount Doom. He is also mentioned in Tolkien's posthumously published works, The Silmarillion and Unfinished Tales. His role will be played by Poblo. Dwalin was one of the twelve companions of Thorin and Bilbo on the Quest of Erebor. 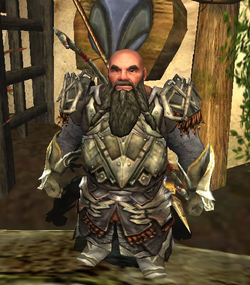 The son of Fundin and younger brother of Balin, Dwalin was the first Dwarf to arrive at Bag End. He wore a dark green hood and a golden belt, had a blue beard, and like his brother Balin, he played the viol. Dwalin lent a hood and cloak to Bilbo when they set out on their journey. After the events in The Hobbit, Dwalin ruled Thorin's halls in the Blue Mountains. He died in the year 91 of the Fourth Age at the age of 340, very old even for a Dwarf. His role will be played by Ulul. You're welcome to take part in our Production set!